Please welcome Conrad Williams to the blog! His new suspense novel, Dust and Desire, just came out this week, and he wrote a great piece about creating memorable villains. Enjoy! The antagonist in Dust and Desire – The Four Year Old, otherwise known as ‘Wire’ – is a young man with a score to settle. I wanted to make Wire extraordinary – so he is athletic, powerful, nimble and not afraid to kill – but he carries with him a vulnerability. He’s a mummy’s boy, and his raison d’être can be linked back to his formative years in Liverpool. He had to be scary, dominant, violent, but I didn’t want him to be an übervillain. It was important his character reflected this, so there are moments of self-doubt, of worry. He’s driven – after all, he dedicates much of his early life to becoming as fit as he possibly can – but he suffers from insecurities. He is not immune to fear. I wanted to erase as much as possible of the distance between him and us to the extent that it wouldn’t be too much of a stretch to find ourselves in his shoes. I was initially a little worried about how a young man – a boy, in some ways – would work as a baddie, but Pinkie, in Brighton Rock is only 17 and feared by the characters that surround him. I’m not trying to find parity with Graham Greene, of course, but that was the precedent that reassured me. In the end, his youth also underpins his fearlessness and determination, factors that can be quite intimidating to those of us (including Joel Sorrell), approaching middle age. I think the fact that Wire has his own narrative territory within the novel (and that it is written in his own voice) helps. We get under his skin and begin to understand his motivations a little, and his reasons for taking such extreme action. We get to see how he was moulded, how his edges were sanded to some degree by the people he was involved with and worked for. His insecurity comes in different forms, not least in the way he feels he needs to be tested. He carries in him the little boy who wants to be noticed and patted on the head. When creating a villain, it’s important not to gloss over these elements, the things that make a person – even one capable of monstrous acts – human. I felt it was important to provide a counterpoint, via poignancy, to the horror and the bloodshed in the story. It’s not an attempt to make what Wire does palatable, or provide mitigation, but to contribute a reason why. So many villains in fiction are brilliant, bulletproof, ultra calm, ultra efficient. It’s a temptation difficult to resist. Hannibal Lecter is a magnificent creation and I think Thomas Harris is a genius, and his work has kept me up late at night, but Lecter is a fantasy, a Frankenstein’s monster patched up from real-life killers (as is his The Silence of the Lambs co-star, Jame Gumb) and given a liberal sprinkling of scholarly brilliance and superhuman strength. Our treatment of villains tends to follow a similar pattern. Good guy finds out who they are. Perhaps Good Guy is involved in an early confrontation, and comes off worse. Good Guy recovers, improves, tracks down Bad Guy and this time is victorious. Bad Guy is killed, or imprisoned. But in real life sometimes the villains win. Sometimes there is no happy ending. Sometimes, if there is a victory, it’s a Pyrrhic one. I’m interested in the flaws and the faults apparent in both mainly good and mainly bad people. We’re not so black and white. It’s in the shades of grey where fascination lies. Rather than seeing them as evil incarnate, we should consider them as cracked mirrors held up to cast subtly disfigured reflections of who we – the supposed good guys – are. In crime fiction such anomalies provide a fertile ground for nuances in plot and character development. Sometimes, when the villain is bested, it’s not always the just outcome. Joel Sorrell, a bruised, bad-mouthed PI, is a sucker for missing person cases. And not just because he’s searching for his daughter, who vanished five years after his wife was murdered. Joel feels a kinship with the desperate and the damned. He feels, somehow, responsible. So when the mysterious Kara Geenan begs him to find her missing brother, Joel agrees. Then an attempt is made on his life, and Kara vanishes… A vicious serial killer is on the hunt, and as those close to Joel are sucked into his nightmare, he suspects that answers may lie in his own hellish past. 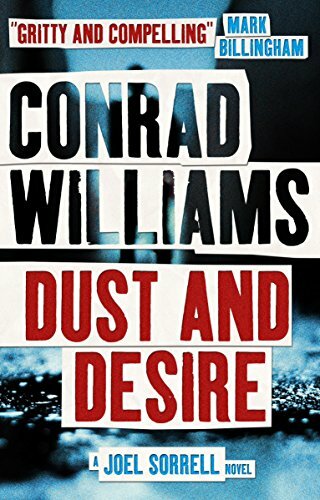 Conrad Williams, Dust and Desire, guest post.